I’m a lunch regular at Alta Strada, one of Michael Schlow’s five restaurants in the Boston area. I understand the restaurant has another location at Foxwoods’ MGM Grand, but I have only ever been to the Wellesley location. By now I know most of the lunchtime hosts and waitstaff by face. Alta Strada is inextricably linked in my mind to the college transfer applications I submitted this spring. In May I finished my associate’s degree, and knowing that I could always fall back on the community colleges’ guaranteed-admission plans with state schools and Suffolk University, I applied to twelve reach schools. Transfer admissions are competitive for a variety of reasons even if you aren’t a reach candidate, so I was prepared for quick and blanket rejections. But one afternoon as I was enjoying lunch at Alta Strada my cell phone rang with a call from Smith College, from an admissions counselor who told me that she had my file open in front of her and she had a few questions. That phone call turned into my first acceptance. When I got the acceptance letter in the mail, I came right back to Alta Strada to celebrate. 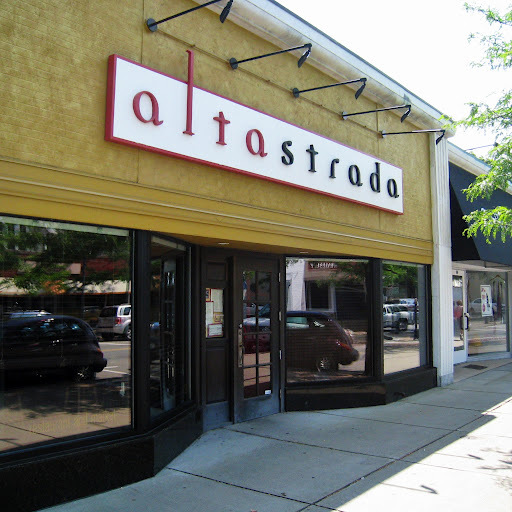 The dining room in Alta Strada is sunnier from the inside than it appears from the outside. My boyfriend and I always get a seat along the right wall, and I sit on the inside bench so I can look out into the dining room and toward the windows. I love that although Alta Strada has excellent food and service, it never feels overcrowded or excessively loud during the lunch hour. I’m sensitive to noise, and Alta Strada feels pleasant and calm. So, on to the food. Lunch always begins by divvying up the bread. 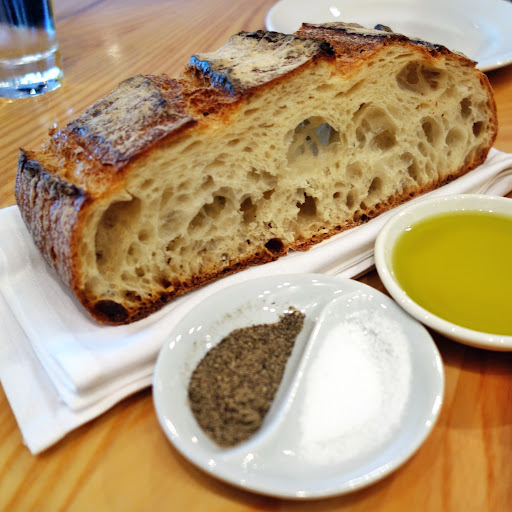 Alta Strada’s bread has a thicker, almost resistant-to-bite crust with a perfectly soft, chewy interior. I usually tear this soft yumminess right out of the crust and eat it with some olive oil and a sprinkle of salt. Alta Strada’s bread is delicious. 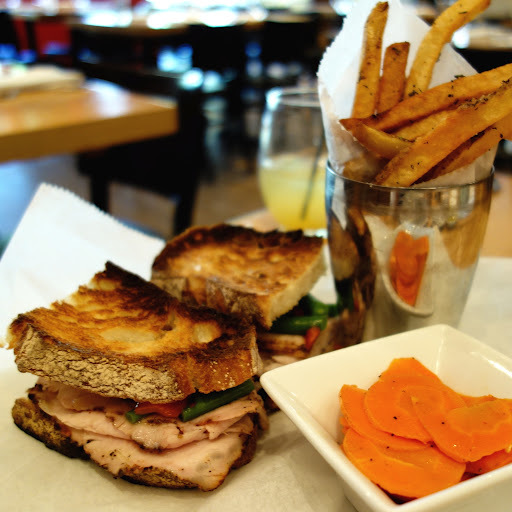 I was introduced to Alta Strada because of their slow-roasted pork sandwich ($12). You know how I feel about the Vietnamese ham sandwich at A&J King’s? That’s how my boyfriend feels about Alta Strada’s slow-roasted pork sandwich with spicy green beans and red peppers, which he orders with “no cheese, no mustard.” He isn’t a vegetable person so it’s notable that he even tolerates a sandwich with green (string) beans and red peppers, let alone that he appears to be addicted to it. He waited a whole month while we were dating before bringing me here, but I don’t think we have gone a month away from Alta Strada since. And I can count on one hand the number of times he has ordered anything other than the pork sandwich. Slow-roasted pork sandwich with spicy green beans and red peppers (sans mayonnaise and cheese). Maybe that obsessiveness is infectious, because the Alta Strada burger ($14) became the only thing that I ordered as soon as I discovered it. The burger is a quirky departure from the norm in that it is served not on the traditional bun, but rather on grilled sandwich bread. The choice seemed a little strange the first time I laid eyes on the burger, but once I tasted it I looked forward to seeing this twist on burgers at other restaurants. 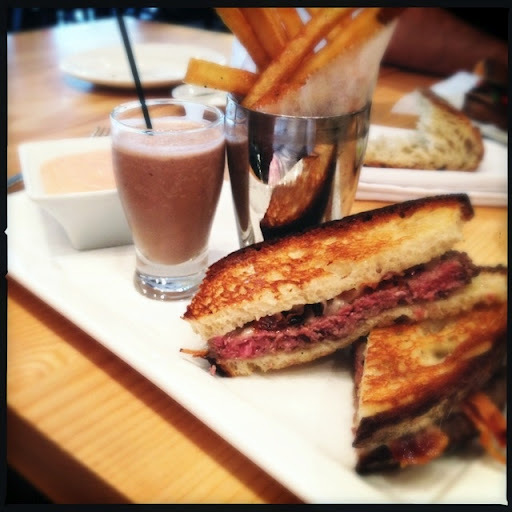 It was early 2011 when I first became addicted to the Alta Strada burger, and at that time it came topped with pancetta and provolone and with a tiny banana-nutella milkshake. Think the classic burger-and-shake combination, on a higher level. In 2012, Alta Strada’s burger recipe changed. It is now topped with caramelized onions, fontina, and crimini mushrooms. Knowing how fond I was of the older version, the staff gave me a heads-up that the recipe was changing and let me know that I could still request the old version if I wanted, although the banana-nutella milkshake would no longer be available. “New version” of the Alta Strada burger with caramelized onions, crimini mushrooms, and fontina. I tried the new version of the Alta Strada burger, despite the fact that I’ve never been particularly fond of mushrooms or onions. And you know what? I genuinely liked it. It was a good burger and I would recommend it. Nostalgic as I sometimes feel for the old Alta Strada burger with pancetta and provolone, I’m actually glad that the restaurant switched the burger up because it provoked me to try new dishes on the menu. If the new burger was this good, I wondered, what else might be equally good? Both the burger and the sandwiches are served with sea-salted french fries and with carrots flavored with cider vinegar and mustard seed. I don’t typically see carrots served as a sandwich side dish, but Michael Schlow makes it work. Alta Strada’s fries are some of the best I have ever had. Perfectly fried, lightly spiced, dipped in tomato aioli: a gourmet french-fry experience if there ever was one. The tomato aioli makes eating regular ketchup seem mind-numbingly boring. It’s a creative take on an otherwise run-of-the-mill condiment — I don’t understand why it hasn’t spread like wildfire to other upscale restaurants. Joel Robuchon’s restaurant in New York used to serve a hamburger with a brilliant house-made vinegar ketchup, which was different but equally inspired. Sadly, Robuchon closed his restaurant in June. 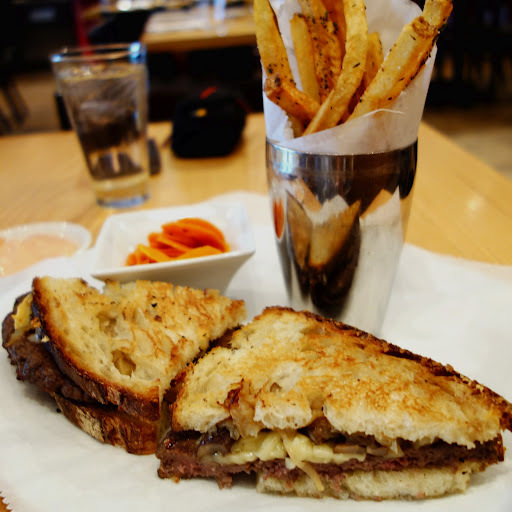 Despite my unwavering loyalty to the Alta Strada burger, since beginning this blog I’ve made a conscious effort to try new things at my old favorite restaurants. For instance, one afternoon at Alta Strada I tried an antipasti of roasted cauliflower with golden raisins and pine nuts ($6) after seeing it on the Perfect Bite’s review of Alta Strada. These flavors surprised me by working together cold but they did, combining into an antipasti that was pleasantly refreshing. The golden raisins added a bit of sweetness and balanced out the spices nicely. 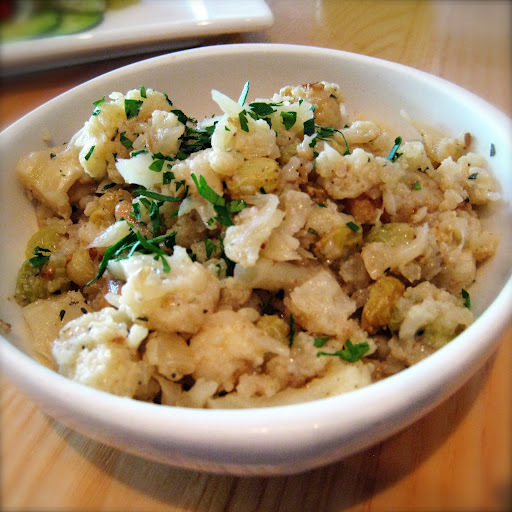 Roasted cauliflower with golden raisins and pine nuts. Another afternoon I mentioned to our waiter that I wanted to try something new, and he recommended the lobster and watermelon salad ($14). I’m glad he did. It was cool and the flavors burst: lobster, red and yellow watermelon, English cucumbers, basil, and a touch of citrus. I had never tasted yellow watermelon before. I don’t think I had even heard of it. But whoever had the lightbulb idea to add it, kudos! My boyfriend and I agreed that a smaller version of this dish would make an perfect early course on a Michelin summer tasting menu. 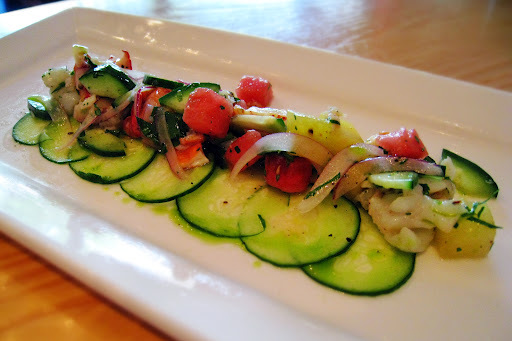 Local lobster and watermelon with English cucumbers, basil, and citrus. I also tried an appetizer not called “bruschetta” but essentially the same, consisting of buffalo mozzarella with Sweet 100 tomatoes and grilled bread ($13). Bruschetta makes an appearance in one form or another on most Italian menus, and at this point in my culinary adventures I have tried the dish executed in many different ways with varying levels of success. The bread varies between thick and thin, sometimes the tomatoes are roughly chopped and sometimes diced, vinegar is either present or not. It’s an inconsistent dish. Because of this, it’s sometimes hard to psych myself up for bruschetta. But I loved Alta Strada’s choice to use both red and yellow tomatoes — the more colorful the dish, the better — and the mozzarella and grilled bread were fantastic. 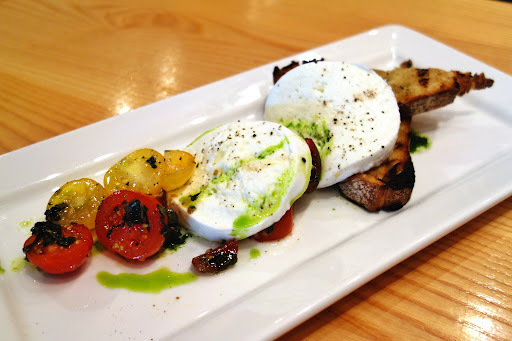 Buffalo mozzarella with red-and-yellow tomatoes and grilled bread. And although I don’t typically order dessert with lunch, I did get lured into trying the “nutella budino” ($8) that I constantly saw staring at me from Alta Strada’s desserts blackboard. The dessert consists of nutella-flavored pudding with whipped cream, chopped hazelnuts, and a hazelnut shortbread. This was a fun end to my lunch, especially as I’m a nutella fan. 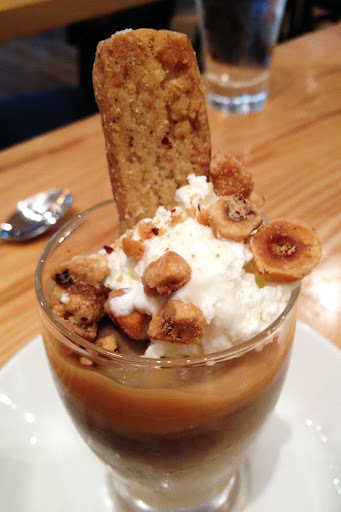 “Nutella budino”: nutella-flavored pudding with whipped cream, chopped hazelnuts, and hazelnut shortbread. As I said, I’m a lunch regular at Alta Strada. But in roughly eighteen months of going for lunch I had never gone for dinner. When I finally got around to it this summer, the staff were happy to see us at such an usually late hour (~5:30pm, ha) and although the restaurant was quite busy they quickly found a place for us. I note this because it is telling behavior. The reason they went out of their way to accommodate me isn’t because I write an obscure Tumblr blog, but because I regularly patronize their restaurant. This is how business should work. If a restaurant is paying attention to customer loyalty, that means it cares about customer experiences. And those are invariably the great restaurants. Back to dinner. 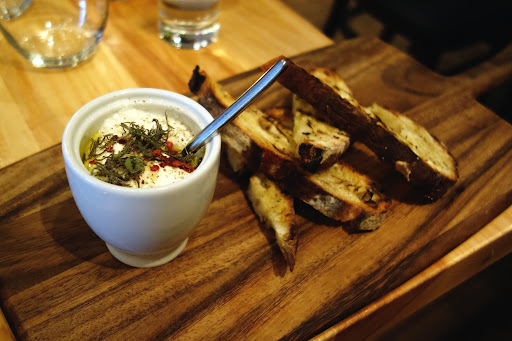 The first antipasti we had was homemade ricotta garnished with sage, crushed red pepper, and a little olive oil, and accompanied by some of the best crostini I have ever had ($6). Ricotta is an ingredient that I tend to avoid at less-than-upscale restaurants because too often the dish is not well executed and the ricotta is lumpy and bland. But no such worries here. Between the rich, creamy flavor of the ricotta and the Zen-like flavor balance of the garnishes, this was an antipasti I would order again in a heartbeat. After devouring as much of the crostini as I was able to wrestle away from my boyfriend, I washed down the remaining ricotta with the table bread dipped in olive oil. Homemade ricotta garnished with crushed red pepper, sage, and a little olive oil, with crostini. Then I ordered a second antipasti, chilled calamari with cucumber and citrus ($6). A little background about my relationship with calamari: When I was much younger — we’re talking kickball and four-square age — I ate fried calamari on occasion, and I recall enjoying it. Then at some point someone tipped me off that Santa Claus didn’t exist that I was eating squid. Squid. You know, those sea creatures with tentacles that wrap around wooden hulls and drag sailors screaming into the briny deep. This revelation offended my ten-year-old sensibility (“Why don’t they call it squid on the menu instead of calamari, so people don’t accidentally eat it? !”) and obviously, I stopped eating calamari altogether. Fast forward almost ten years, skipping over my vegetarian-diet-with-no-vegetables (“carbohydratarian”…?) and my unexplained and shameful aversion to all things seafood. Today-me loved Alta Strada’s chilled calamari antipasti. Between the cucumbers in this dish and the ones in the lobster and watermelon salad, I am getting the vibe that Michael Schlow or somebody on his staff knows how to compose a dish with cucumbers. 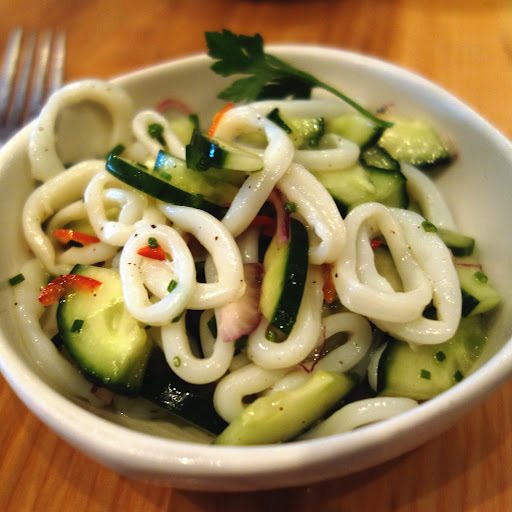 Chilled calamari with cucumber and citrus. For a first course my boyfriend ordered crunchy veal meatballs with spicy tomato sauce ($10), minus the cheese sprinkled on top that I’m sure would have been delicious. They brought him seven meatballs, and I stole one-and-a-half for myself. The “crunchy” part is a breaded, fried crust around each meatball. We both enjoyed the dish very much. 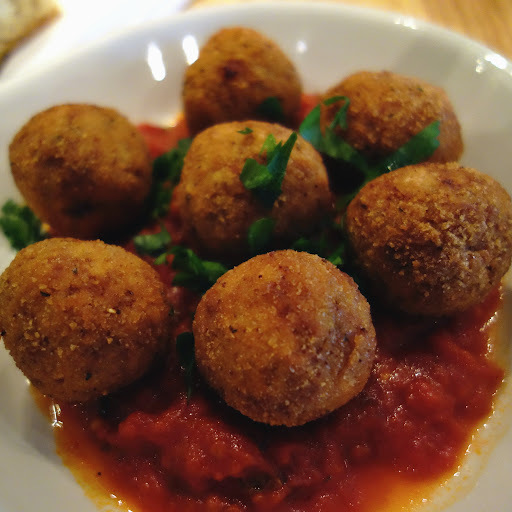 Crunchy veal meatballs with spicy tomato sauce. For his main course, my boyfriend ordered that evening’s special, striped bass with corn salad, corn puree, crimini mushrooms and basil. I am usually indifferent about corn unless it’s in cornbread, but this was an exception; the corn flavor noticeably complimented the striped bass. 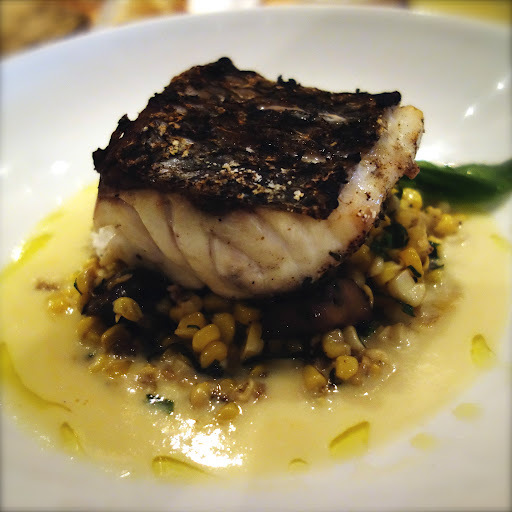 Evening special: striped bass with corn salad, corn puree, crimini mushrooms, and basil. I ordered the spicy chitarra pasta with lobster, shrimp, tomato, and basil ($23) for my main course, once again because of the Perfect Bite’s review of Alta Strada. Between the buttery-ness of the lobster and the spice of the sauce, this dish clicked. I stared at the pasta, lobster, and shrimp on my fork and thought regretfully about how much I had missed out on during those years when I avoided seafood. No offense to readers who don’t care for it, but personally I feel like I missed out. 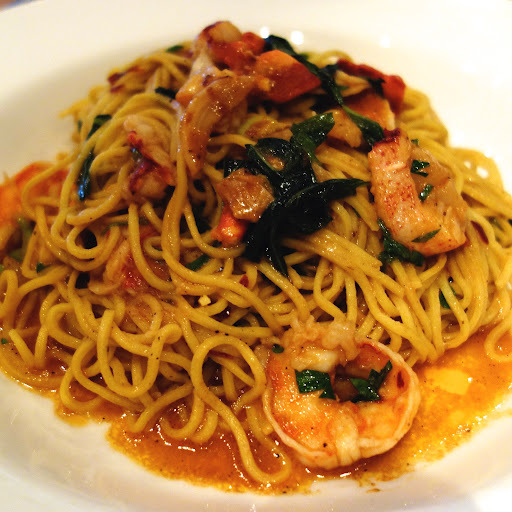 Spicy chitarra pasta with lobster, shrimp, tomato, and basil. Unlike lunch I alwaysalwaysalways have dessert with dinner, and in this case dessert was a tasting of three gelati: vanilla, salted caramel, and chocolate. All three flavors were fantastic, but my favorite was definitely the salted caramel. I wish it was available to purchase by the pint or gallon or lifetime supply. 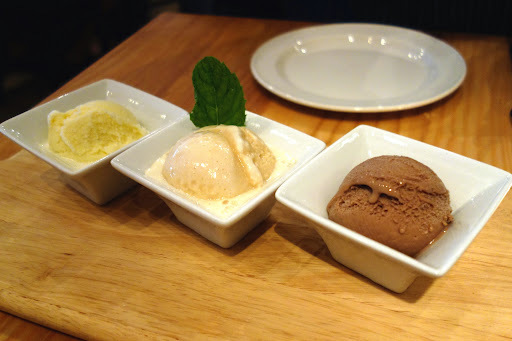 Tasting of three gelati: vanilla, salted caramel, and chocolate. Yum! If you have read my Occasionally Asked Questions section before, you may already know that I’m not aiming for cold objectivity here. I will always be honest in my reviews, but I don’t write bad reviews. I write because it makes me happy to write about food that makes me happy. If I were a professional newspaper critic, maybe I would have to recuse myself from writing about Alta Strada because I go there so often. But here on my website, I can excitedly tell you that the reason I go there so often is that it’s a spectacular restaurant. In many cases I will choose to try a new restaurant over returning to an old one, so that tells you how much I like Alta Strada. It’s my pleasure to recommend it to you.